New Year’s Eve is one of those holidays where expectations outweigh the realities–freezing weather, scarce transportation, raucous crowds and the prospect of corralling all of your friends in one place to avoid ringing in the new year while packed into a stalled subway car. If you’ve a shred of sense, you’re not headed for Times Square, but the city does its best to offer up options that are suitably festive and possibly even a whole lot of fun. See the list below for some ways to avoid dropping the ball on this year’s NYE plans. Taking place at 236 Prospect Avenue in a large Victorian banquet hall that recalls “the splendor of Versailles,” this Brooklyn bacchanal thrown by the zany House of Yes hosts invites you to “abandon your past in the madness of dance.” On the schedule are DJs, “luxury cuddle puddles,” a “Midnight Metamorphosis” and much more. Tickets range from $60-$100, and the party pops til 5AM. The lesser-known creative crew at Rubulad have been throwing offbeat festivals in the BK since the bad old 1990s, giving burners something to do until the next Black Rock City expedition. But no matter how ‘bro infested or over-the-top things got, there is an essential innocence and spirit of fun to events that has likely been the reason they’re still toasting the new year in the 21st century. 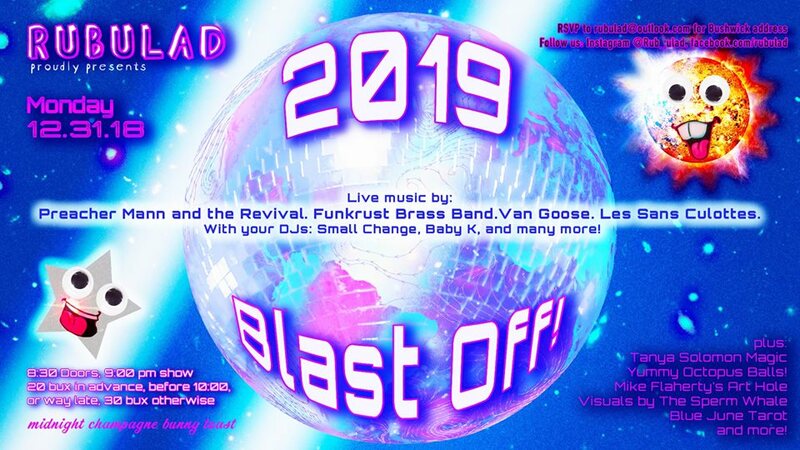 The location of the latest fest is a secret til you buy a ticket; what’s no secret: The DJs and bands are talented and fun, there will be a “midnight champagne bunny toast,” and tickets won’t break the bank at $20-$30. Ring in the new year at this “immersive experience blending nightlife and a world of fantasy” at historic Sony Hall beneath the luxurious Paramount hotel. You’ll be perilously near the heart of Times Square, so arriving at this pricey party (tickets: $109-$2,800) may take a bit of doing, but you should be fine as long as you stay indoors. Safely hidden away at Knockdown Center (52-19 Flushing Avenue) a contemporary arts and performance space in quietly hip Ridgewood, Queens, this artsy party couldn’t be further from Times Square. On the menu are three musical stages, a silent disco, live painting, interactive art installations and performances, a bartering blackjack table and “cosmic creations to transcend time and space.” Tickets start at $75. From the masterminds of uber-immersive-experience “Sleep No More,” this masquerade ball at the storied McKittrick Hotel at 530 West 27th Street features the usual suspects: open bar, performances, decadence and dancing. Tickets start at $150 for after-midnight entry and go up from there; you can experience the show as part of one of the pricier packages. If this burlesque-tinged celebration of lower Manhattan hedonism lives up to its name, you can expect a night filled with live bands, sparkling champagne and dazzling performances rich with mythological and celestial themes. It’s happening at India House at 1 Hanover Square; tickets range from $75 to $525 for a champagne table for two. 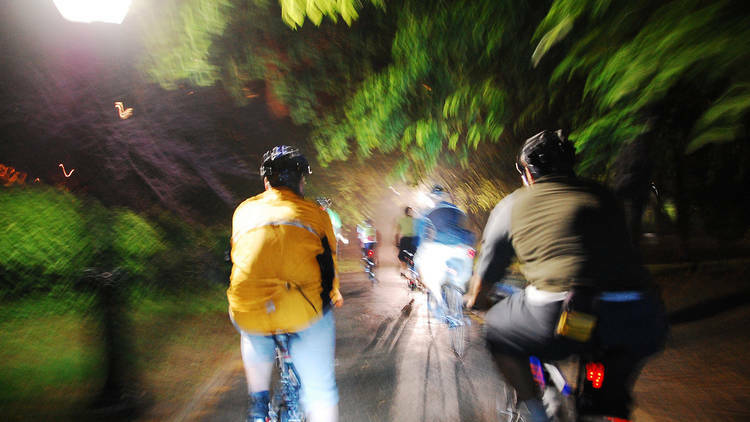 Shift gears from the dance party circuit with this annual bike ride with the cycling advocates and social activists at Time’s Up. After the ride you can still party, but instead of bathing in bubbly at Versailles, you can honor the grassroots history of NYC with an afterparty at the Museum of Reclaimed Urban Space in the former C Squat at 155 Avenue C in Alphabet City. Check here for where to start the ride (or you can skip it and head straight for the party, for which tickets are $25). 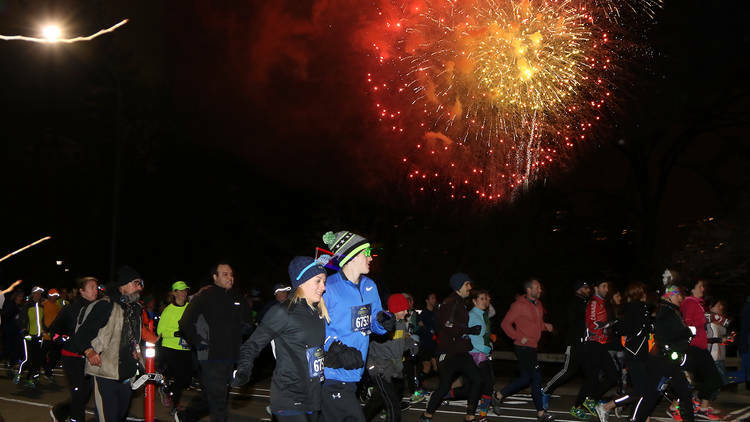 If you’d rather greet the new year burning calories than quaffing champagne, start getting in shape for this annual four-mile midnight run around the Central Park “inner loop” with the New York Road Runners. The race is preceded by music and dancing starting at 10:00 P.M. and ends with a fireworks display. Entry fees start at $70 for non-NYRR members with discounts for members. Keep it low-key and highbrow with this annual concert at the Cathedral of St. John the Divine at 1047 Amsterdam Avenue on the Upper West Side. Founded by Leonard Bernstein in 1984, this year’s New Year’s Eve Concert for Peace includes William Boyce’s Symphony No. 1 in B-flat, soloist Sidney Outlaw and the choir, a performance of “make peace” by David Lang and the New York premiere of Wayne Oquin’s “Alleluia.” There will also be music by Mozart and Bach and special guests throughout the evening. The concert starts at 7 P.M.; tickets range from $40-$100. Happening at the park-adjacent Grand Army Plaza from 10:30 P.M.–12:30 A.M., Brooklyn Borough President Eric L. Adams and the Prospect Park Alliance are hosting this free, family-friendly event with live entertainment followed by fireworks at the stroke of midnight. 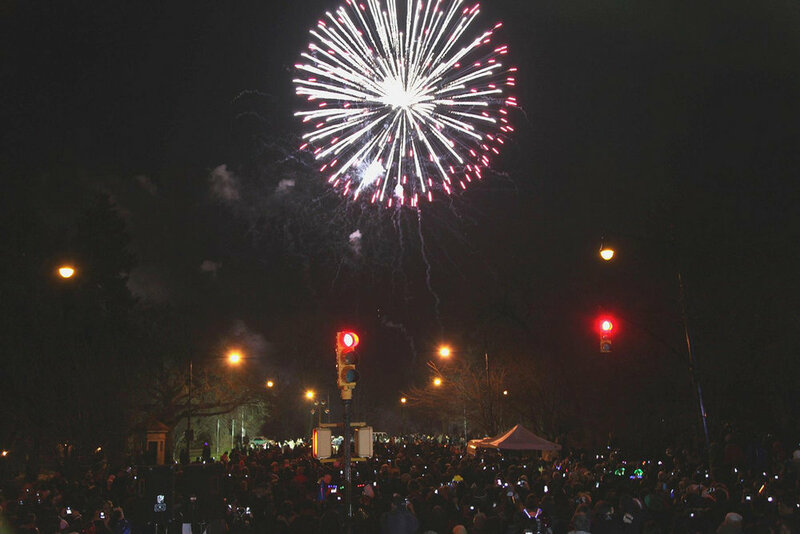 The fireworks display is in its 39th year and attracts tens of thousands of revelers to Prospect Park.